Our event with Rhyl FC was held at Rhyl High School again this year and saw us deliver to 180 pupils in the whole of year 7. The Welsh Education team delivered workshops with the young people that included activities that used other sports role models as examples to talk about different cultures and areas where they have received racism. 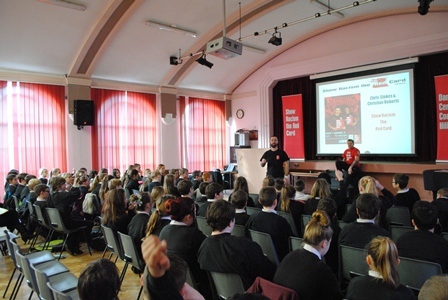 The pupils watched the new SRtRC DVD and had the opportunity to ask questions on what they had learnt during the day. Each pupil had a Rhyl FC SRtRC poster. This event was funded by the FAW, the Big Lottery Wales and the Welsh Government.